This Key Largo property is a paradise in a gated private community. This confortable park model includes cable TV, full kitchen, bathroom, Queen size bed in master bedroom and much more. Outside terrace with BBQ grill and full sink. Enjoy your evenings relaxing in this comfortable outside area. Many amenities, they include beautiful boat ramp, heated pool, tennis and basketball courts, kiddy park, picnic tables and much more. The complex has a great water view and a breathtaking sunset. Many restaurants close by and delivery service is available in case you don't want to take advantage of the full kitchen. Key Largo, the scuba diving capital of the world, with John Pennekamp State Park and Henry Harris Park within minutes from this location beautiful sunken ships and tropical reefs. Boat rentals, jet skiing, parasailing is available. Everything from swimming with dolphins to the latest movie attractions is close-by. Key West is a scenic 95 miles south from this location. 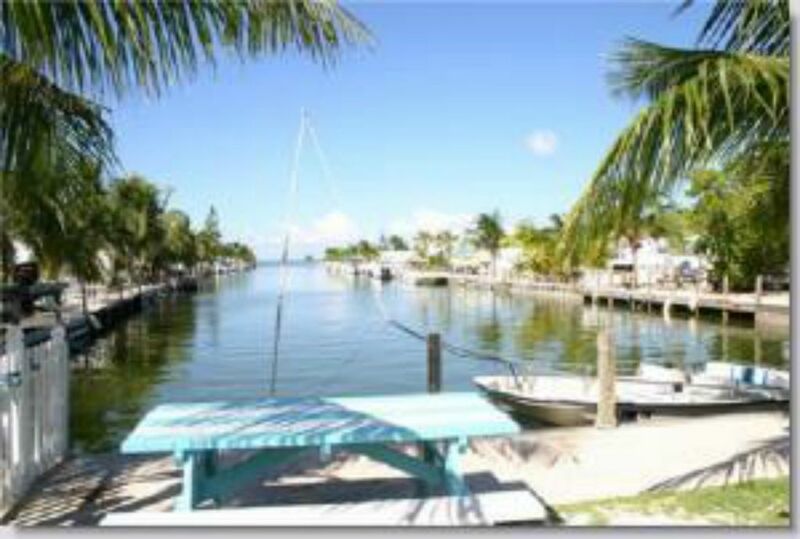 This cozy place makes a great 'home base' for all your vacation plans in the Keys and South Florida. My husband and I decided to spend a few days in Key Largo and visit Key West after a week in Orlando. Check-in was not as easy and it should have been. Apparently this landlord rents this trailer himself and the property management company also rents this unit. They were unaware when we arrived that the landlord had in fact rented this unit to us for three nights. Fortunately, we arrived during the day and after half an hour, the office was able to call the landlord and straighten this out. I am not sure what would have happened after hours with the security guard because check in is left to him if you arrive after the office is closed. The trailer is sufficient for two people only and since we were a couple, it worked out well. Perhaps adding one small child would also work. Internet is almost non existent anywhere but in the lanai. It is so slow that we used our own phones and data instead of trying to use their provider. Bed was okay - a little soft. The best part of this unit was the lanai which also had a TV. There were sufficient towels and kitchen utensils for two people. Make sure you are a couple that get along because space is limited particularly between the bedroom and the living area (you have to go through the very small bathroom). The sheets were clean, the water hot, and the shower had plenty of water pressure. We did not try the pool although it looked ok. A house is being built beside this unit so not sure when construction will end although nothing was happening while we were there. Because Key West and Key Largo are super expensive, it is a good place to stay if you are actually going to be away from the unit most of the time. The unit is run down and for sale so not much attention to the things which are in need of repair. The unit would be fine for 2-3 nights for a couple or a couple with one small child. Make sure you check with the property management to ascertain that they have your reservation if you make it through the landlord. There are great restaurants in Key Largo and Key West which is two hours away is fabulous. The landlord is easy to deal with and responded promptly to questions. Consider it for a short stay but know it is on the smaller side and a little run down. During your check-in, the management company made a mistake; they immediately contacted me, and I advised them that you had priority. So, nothing was going to happen to your reservation. I apologize for those 30 minutes you had to wait. However, the rest of your negative comments about my property I do take offense to it. The property is a Park Model Trailer with a nice size room. It has a Queen size bed in the bedroom, and two (2) Full-size futons and will accommodate six (6) people without a problem. It has a full kitchen and regular bathroom. The unit is well kept and clean. There is plenty of utensils, blankets, and sheets for six (6) guest. It is nice to hear you acknowledge that my price are reasonable. I have been in business since 2008, and most of my guest are very happy to the point they return every year. Unfortunately, things will happened from time to time; however, the majority of my guest will call me, and I allow me the opportunity to address the problem. Thank you for staying with us, I hope you could find a place that will suit your needs and budget. Jeremy, I'm so sorry that you had few inconveniences; unfortunately, due to health issues I was not there and as in any property things happens from time to time. but I also pay the management company to resolve any issues with the property. I will speak to them. I will work on that immediately and make the necessary corrections. Exactly as per the pictures. Safe and secure location. Bed not extremely comfortable. Campground wifi was not working while we were there which was not ideal. The staff and property owner are all welcoming, helpful, and easy to communicate with. Thank you Brittany, I'm glad you had a great time and your are welcome anytime. The owner is great. We had a very nice time. We will return. Very nice place, clean and everything was there just like in my home. Very nice people, one took us out on his boat. Big a heated pool. I will return.